In order to investigate the effects of the dietary supplementation of organic acids, prebiotics and probiotics on broiler chickens, a total of 288 day-old male Cobb chicks were allocated in a completely randomized design according to a 2 x 4 factorial, consisting of two levels of crude protein (recommended or low (85% of recommended)) and a four feed-additive programme. The basal diet without any feed additive served as control and one of the following additives, organic acids, a prebiotic and a probiotic, were added to the basal diet to form the other treatments. Starter and finisher diets were offered from 1 to 21 d and 22 to 42 d of age, respectively. The birds were reared in an open-sided house system under natural tropical conditions with the same housing and general management practices. Lowering the dietary protein level significantly decreased bird performance throughout the experiment. Additives had no significant effects on body weight, body weight gain and feed intake. Dietary supplementation with the prebiotic resulted in significant improvements in feed efficiency during 22 - 42 d and 1 - 42 d of age. At 21 and 42 d of age birds fed the diets containing the prebiotic had the longest duodenal villi compared to the other treatments. Jejunum villi, and duodenum and jejunum crypt depth were not influenced by additives. At 21 d of age the dietary addition of the prebiotic and organic acids significantly increased the antibody titres against Newcastle disease compared to the control group. It could be concluded that under the condition of the current study, the prebiotic affected performance, small intestinal morphology and immunity of broiler chickens significantly. Beneficial effects of dietary additives such as probiotics, prebiotics and organic acids, on the energy and protein utilization of poultry have been reported (Samarasinghe et al., 2003; Angel et al., 2005; Pirgozliev et al., 2008; Yang et al., 2008). It has also been suggested that feed additives may be more efficient when low nutrient diets are fed. Generally, low density diets are more profitable and resulted in less environmental pollution problems. In recent years, the high price of protein sources as well as environmental concerns related to high nitrogen excretion have resulted in increasing interest for using low protein diets in poultry production (Torres-Rodriguez et al., 2005). Considering the positive effects of probiotics, prebiotics and organic acids on protein utilization, using low protein diets supplemented with these additives in broiler nutrition may be practical. In this regard, Angel et al. (2005) reported that the feeding the low nutrient diets resulted in poorer performance, but dietary inclusion of probiotics helped the birds to overcome this negative effect by improving nutrient retention. Moreover, it has been reported of that probiotics, prebiotics and organic acids have positive effects on the immunity system (Zulkifli et al., 2000; Huang et al., 2007; Abdel-Fattah et al., 2008). However, there are only a few comparative reports on the effects of probiotics, prebiotics and organic acids on performance, immunity and the intestinal morphology of broilers fed different levels of protein. Thus, the main objective of this experiment was to study and compare the efficacy of these additives on the above-mentioned parameters. This experiment was conducted with 288 day-old male Cobb broiler chicks. All procedures used in this experiment were approved by the Institutional Animal Care Committee of the University Putra Malaysia (UPM). Birds were obtained from a commercial hatchery. Upon arrival, they were weighed individually, wing banded and assigned at random to eight experimental treatments. Each treatment had six replicates (cages) of six birds. This experiment was a 2 x 4 factorial arrangement with two levels of dietary crude protein (CP) and a four feed-additive programme. The two levels of protein were the recommended 230 and 200 g CP/kg for starter and finisher diets, respectively (NRC, 1994), and low levels, 195 and 170 g CP/kg for starter and finisher diets, respectively. The feed additive programme was as follows: 1. The basal diet without any feed additive served as the control; 2. the basal diet supplemented with organic acids; 3. the basal diet supplemented with a prebiotic; 4. the basal diet supplemented with a probiotic. All additives were commercial products, in powder form and added to the diets according to the levels recommended by the manufacturers. Additives and their dosages were: Organic acids (Sunzen Corporation SdnBhd, Malaysia), at 1.5 g/kg of the starter and finisher diets; the prebiotic, MOS (Bio-Mos, Alltech Inc., Nicholasville, KY), at 2 and 1 g/kg of starter and finisher diets, respectively, and the probiotic, Bio K1 (KBNP, INC, Korea), at 2 g/kg of the starter and finisher diets. This probiotic contained at least 1 x 10 10CFU Bacillus subtilis/kg and at least 1 x 10 6CFU Clostridium butyricum/kg. The compositions of the experimental diets are presented in Table 1. Crude protein, lysine and methionine levels of the low protein diets were 85% of recommended levels suggested by the NRC (1994). However, both recommended and low diets contained similar concentrations of the other nutrients, viz. metabolizable energy, other amino acids, calcium and phosphorus. The nitrogen content of the diets was measured using the AOAC (1990) procedure. Crude protein was calculated as N x 6.25. The starter and finisher diets, in mash form, were fed from 1 to 21 d and 22 to 42 d of age, respectively. The birds were reared in wire-floored cages in an open-sided house system under natural tropical conditions with the same housing and general management practices. Feed and water were provided ad libitum and lighting was continuous throughout the experiment. Feed intake was measured weekly, on a cage basis. The chicks were individually weighed weekly and feed conversion ratios (FCR) were calculated. Mortality was recorded daily throughout the experiment and the FCR was adjusted for mortality. On days 7 and 21 the birds were vaccinated against Newcastle disease (POULVAC NEW LASOTA, B1 Type, Fort Dodge, Brazil) via the intraocular route. At d 21 (end of starter period) and 42 (end of finisher period), one bird was randomly sampled from each cage (six birds per treatment) and killed by cervical dislocation. Immediately after killing, the whole length of small intestine was separated and its full weight and length were recorded. After that, different parts of the small intestine including the duodenum (from gizzard outlet to the end of pancreatic loop), jejunum (segment between pancreatic loop and Meckel's diverticulum) and ileum (segment between Meckel's diverticulum and ileocaecal junction) were removed and their weights and lengths were recorded. To measure villus height and crypt depth, 2 cm segments from the middle part of the duodenum and jejunum were removed, flushed with physiological saline and immediately put into a 10% buffered formalin solution until further processing. After embedding the samples in paraffin, a 5 mm section of each sample was placed on a glass slide and then stained, using haematoxylin and eosin, for measuring villus height and crypt depth. The distance from the tip of the villus to the villus crypt junction represents villus height, while crypt depth was defined as the depth of the invagination between adjacent villi. A total of 10 villi and 10 crypts per sample (40 villi and 40 crypts per treatment) were measured using light microscope. On days 21 and 42, 1 mL of blood was collected via the brachial vein from one bird per cage (six birds per treatment). Blood serum was separated. Serum concentration of antibody titre against Newcastle disease was determined using an enzyme-linked immunosorbent assay (ELISA) kit. Data were subjected to two-way analysis of variance by using the General Linear Model (GLM) procedure of SAS (SAS Institute, 2005). The Duncan's multiple range test at 5% probability was used to compare means. The effects of protein level and feed additives on body weight, body weight gain, feed intake and FCR of the broilers during the different phases of experiment are shown in Table 2. There were no significant differences during the different phases of experiment between the additives and the control groups in body weight, body weight gain and feed intake. Also, during the starter phase (d 1 - 21), FCR was not affected by feed additives. However, during the finisher phase (d 22 - 42), the birds receiving the diet containing the prebiotic had a significantly better FCR than the other groups. Due to this improvement, overall (d 1 - 42) FCR was also better for the prebiotic treatment compared to the other treatments. Briefly, the performance data indicated that among the different feed additives (organic acids, probiotic and prebiotic), a significant growth promoting effect was observed only for the prebiotic. The dietary addition of both organic acids and probiotic had no significant effects on performance traits. Beneficial effects of prebiotics on broiler performance have been shown by Xu et al. (2003). They reported that birds fed diets containing 0.2% and 0.4% of a prebiotic, had a better performance than the control. Xu et al. (2003) pointed out that prebiotics are able to increase digestive enzyme (intestinal protease and amylase) activity, which affect energy and protein utilization (Samarasinghe et al., 2003; Yang et al., 2008). It is possible that prebiotics, by improving the microbial ecology of the intestine, reduce passage rate of the digesta and improve the digestibility of amino acids (Biggs & Parsons, 2007). Changes in mucosal architecture and increases in villi height have been reported to be due to the supplementation of prebiotics (Yang et al., 2007). Therefore, the improved FCR in the birds fed the prebiotic supplemented diets could be related to the above mentioned effects. The dietary addition of the probiotic in the current study did not show any positive effect on performance. Similarly, Willis & Reid (2008) reported that the dietary inclusion of probiotics (minimum presence of 1.04 x 10 8CFU/g) had no significant effect on broiler growth performance. Generally, results reported in the literature on the beneficial effects of probiotics, prebiotics and organic acids on broiler growth performance are inconsistent. Numerous factors such as the environment, management, nutrition, additive type, dosage and bird characteristics (age, species, stage of production) can affect broiler responses to probiotics (Yang et al., 2009), thereby accounted for the contrasting results. Farm rearing condition is a major factor contributing to variable results. Angel et al. (2005) reported that under favourable rearing condition, without any disease or stress, dietary supplementation with probiotics had no beneficial effects on broiler growth performance. In another study, Timmerman et al. (2006) concluded that the positive effects of probiotics on high performance broilers would be lower than in low performing birds. In the current study, broiler performance was not affected by organic acids supplementation. These results are in agreement with the results of Hernandez et al. (2006), who did not find any positive effects of organic acids on performance. They concluded that the lack of significant effects on performance could be related to ideal rearing condition of their experiment, because growth promoting effects of antimicrobial additives will become apparent under suboptimal conditions, for instance poor hygiene condition or the feeding of low digestible diets. The buffering capacity of the diet, presence of other antimicrobial compounds, acid type and concentration, composition of diet and environment of the experiment could be considered as responsible factors for inconsistency in results (Dibner & Buttin, 2002). 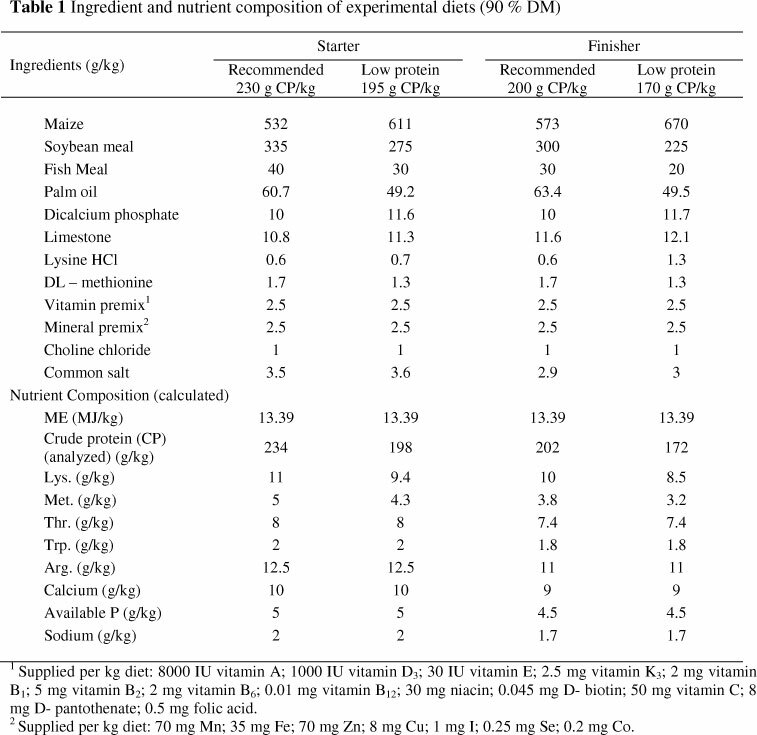 Therefore, attention should be paid to these factors, for example, in a recent study, Isabel & Santos (2009) concluded that the dietary addition of organic acids salts (calcium propionate and calcium formate) had no effect on broilers body weight and body weight gain, while birds fed a diet containing organic acids had a poorer FCR compared to the control birds. Diet palatability and therefore bird appetite can be influenced by organic acids (Cave, 1982). The effects of protein level on bird performance (body weight, body weight gain, feed intake and FCR) are shown in Table 2. On day 21 (end of starter period), the birds fed the low protein diets had a lower (P <0.05) body weight (712 g) than those fed the recommended levels of protein (870 g). This difference in body weight remained consistent until the end of experiment (42 d). Body weight gain at different stages of the experiment was lower in the broilers fed the low protein diets. Moreover, birds fed diets containing the recommended levels of protein had a higher (P <0.05) feed intake and better FCR than those fed the low protein diets. Therefore, it could be concluded that the lowering of the dietary protein level influenced bird growth performance negatively throughout the experiment. Significant effects of dietary protein and amino acids on bird performance are well documented (NRC 1994; Torres- Redriguez et al., 2005). There were no interactions (except for feed intake between d 1 - 21) between additives and protein levels for performance traits. The effects of protein level and feed additives on villus height and crypt depth at 21 d and 42 d of age are shown in Table 3. On d 21, birds fed the diets containing the prebiotic had the longest duodenum villi compared to the other treatment groups, while jejunum villi and also duodenum and jejunum crypt depth were not affected (P >0.05) by additives. The same effects of additives on villus height and crypt depth were observed at d 42. On the other hand, these results showed that similar to bird performance, probiotic and organic acids had no significant effects on villus height. Changes in villus height due to the supplementation with prebiotics have been reported previously. Baurhoo et al. (2007) found that birds fed diet containing a prebiotic had longer villi than those fed the control diet. In a study conducted by Xu et al. (2003), dietary addition of a prebiotics (FOS) significantly increased villus height. They suggested that these changes may be related to the ability of FOS to create a more favourable intestinal microbial environment and are not a direct effect of FOS on the intestinal tissue. No significant effects of organic acids on villus height have also been reported by Vieira et al. (2008). They indicated that the addition of a blend of organic acids did not affect villus height or crypt depth at 7, 14, 21 and 42 d of age. Some information on the gut health could be obtained by studying the structure of the intestinal mucosa (Xu et al., 2003). Villus condition is a common criteria measurement for investigation of the effects of nutrition on gut physiology. However, in many cases significant correlations were not observed between performance and villus height or crypt depth (Vieira et al., 2008). Longer villus could be considered as an indicator of an active functioning of intestinal villi. Increased villi height provides more surface area for nutrients absorption (Awad et al., 2009). Factors such as pathogens, chemical substances and stressors have deleterious effects on gut microflora or intestinal epithelium. Consequently permeability of epithelium as natural barrier can be changed, and harmful compounds and pathogens can enter the cell, thereby changing the metabolism, nutrient digestion and absorption. These conditions can cause chronic inflammation in intestinal mucosa. Due to these changes, villus height and nutrient digestion and absorption will decrease but cell turnover will increase (Paul et al., 2007). In the current study, supplementation with the prebiotic had beneficial effects on performance and intestinal morphology. Positive effects of prebiotics could be related to their inhibitory effects on intestinal pathogens. It has previously been reported that prebiotics are able to control pathogenic or potential pathogenic bacteria which possess type-1 fimbriae, resulting in better performance (Ferket, 2004). As shown in Table 3, only jejunum villus height was significantly influenced by dietary protein level at 21 d of age and protein level had no significant effects on other parameters. Therefore, it can be concluded that dietary protein level has the potential in changing intestinal morphology. Previously, Yamauchi et al. (1993) found that gut morphology will be influenced by dietary level of nutrients. 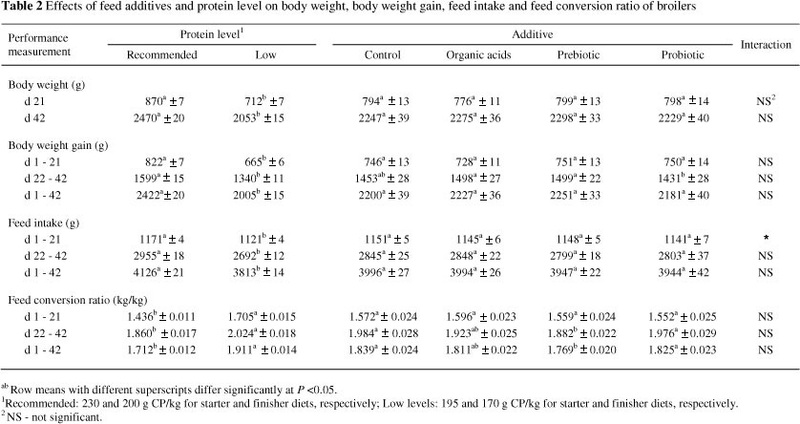 The effects of feed additives and protein level on weight and length of small intestine and different parts of small intestine are presented in Tables 4 and 5. Significant differences were not observed (P >0.05) between additives and control treatments for different parameters on 21 or 42 of age. Similarly, Iji et al. (2001) and Awad et al (2009) reported that the addition of a probiotic and a prebiotic, respectively, had no significant effects on the weight of the small intestine. It is interesting to note that birds fed diets supplemented with organic acids had a significantly longer small intestine than those fed diets containing probiotic or prebiotic at 21 d of age. A significant difference was observed between organic acid and probiotic treatments for small intestine length at the end of experiment. In a recent study, Abdel-Fattah et al. (2008) indicated that the dietary addition of organic acids increased weight and length of small intestine. The effects of protein level and additives on antibody titres against Newcastle disease (ND) are shown in Table 6. At 21 d of age, dietary addition of the prebiotic and organic acids resulted in significant increases in antibody titres against Newcastle disease, while significant differences were not observed between the probiotic and the control treatments. At 42 d of age, significant differences (P >0.05) were not noticed between different treatments. Beneficial effects of prebiotics and organic acids on immune system have already been indicated. Huang et al. (2007) concluded that dietary addition of oligochitosan resulted in a better immunity response as measured by elevated levels of serum antibody titre against Newcastle disease and immunoglobulins (IgM, IgA and IgG). Also, the prebiotic had significant effects on development of immunity related organs including the bursa of Fabricius and the thymus. They concluded that prebiotics may improve bird immunity through different ways, as follows: functioning as an antigen and attach to bacteria to start immunity responses, direct promoting effects on immunity system by the active group(s) and competition with pathogens for nutrients. Colonization of specific pathogens can be inhibited by prebiotics, but these pathogens are allowed to be presented to immune cells as attenuated antigens. Also, prebiotics are able to increase macrophage responses in different species of animals (Yang et al., 2009). Beneficial effects of organic acids on broilers immunity have been reported previously. In this regard, Abdel-Fattah et al. (2008) concluded that the dietary addition of organic acids resulted in a higher immunity response. In their research, the birds fed an organic acid supplemented diet had heavier immune organs (bursa of Fabricius and the thymus) and also a higher level of globulin in their serum. Concentration of globulin is used as an indicator for measuring immunity response. They suggested that improvement in bird immunity could be related to the inhibitory effects of organic acids on gut system pathogens. In the current study, at both 21 and 42 d of age, antibody titres against Newcastle disease were not influenced by protein level (P >0.05). However, significant effects of dietary protein and amino acids levels on bird immunity have been reported (Kidd, 2004). Payne et al. (1990) reported that the feeding with very low protein diets had negative effects on cellular immunity of birds. Significant interactions between additives and protein levels were not observed for antibody response to Newcastle disease. In conclusion, feeding at low levels of protein resulted in poorer growth performance. Among the additives, prebiotics had significant effects on FCR, duodenum villi height and immunity. Intestinal weight and length were not affected by the different additives and the antibody titres against Newcastle disease were not affected by protein levels. It could be concluded that under condition of the current study, prebiotics showed significant effects on performance, small intestinal morphology and immunity of broiler chickens.